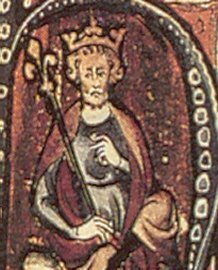 On 6th January 1017 England entered a period of Danish rule when Cnut (otherwise spelled Canute) was crowned King in London’s St Paul’s Cathedral. He was to reign until 1035 and in the meantime also became King of Denmark in 1019 and of Norway in 1028, thus making England part of a North Sea empire. Life during Cnut’s reign was not easy, as he was a stern ruler who countered any opposition with extreme ruthlessness. He also enforced his laws strictly and punishments for misdemeanours were severe. For example, an adulterous wife would have her nose and ears cut off; presumably adulterous men were treated very differently! That said, Cnut was also scrupulously fair and hated injustice. He recognised talent where he saw it and gradually eased out his Danish ministers in favour of English ones. The story that is always told about Cnut is that he commanded the sea to turn back but got his feet wet. The story is largely true, but the point of it is often missed. It was not that Cnut thought himself to be almighty – rather the opposite, because he was seeking to show that he was not. Cnut had a palace at Bosham, a small village on an inlet of Chichester Harbour in West Sussex. Visitors today will note that the inlet is completely dry at low tide and it is possible to drive or walk from one side to the other. However, when the tide comes in it does so very quickly and it is easy to get caught by it or find that you were unwise in your choice of parking place! Cnut knew this very well (apart from the bit about car parking, that is), and so when some of his courtiers started saying silly things along the lines of how powerful he was and that even the wind and waves would obey him, he ordered that he be carried on his throne down to the shore just as the tide was coming in at its usual speed. The words he used were: “Ocean! The land where I sit is mine, and you are part of my dominion. Therefore rise not – obey my command and do not dare to wet the edge of my robe”. Needless to say the inevitable happened, after which Cnut addressed his courtiers with the words: “Confess now how frivolous and vain is the might of an earthly king compared to that great Power who rules the elements”. Let’s hope that one of the courtiers had the good sense to have a towel handy!